Sen. Jon Tester (D., Mont.) touted his support for the Second Amendment in an interview with NBC Montana by saying he uses the right to bear arms when he goes hunting, but records indicate he hasn't been issued a hunting license since 2012. In response to a question from host Maritsa Georgiou about whether the Second Amendment is a tough issue for a "Democrat in a gun state," Tester answered, "Like I've said, Maritsa, for 20 years, we butchered beef and hogs on the farm and when you butcher an animal you start out with a gun. And that's the way it is, it's the way it's done." "It is a tool to me, I use it to control pests, I use it when I’m able to go hunting, to be able to go hunting," Tester continued. The agency has no record of Tester having a license this year. Earlier this month, the National Rifle Association downgraded Tester's rating to a D after he voted against confirming Supreme Court Justice Brett Kavanaugh. 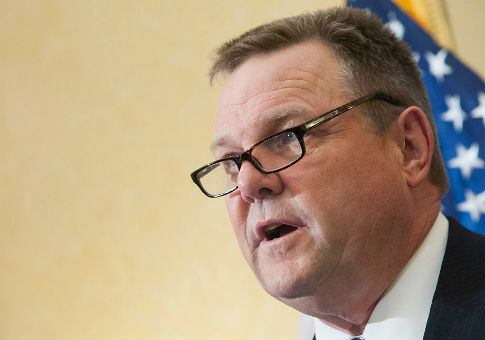 "D.C. Jon Tester once again joined forces with Chuck Schumer and anti-gun liberals to vote against our fundamental right to self-defense," said Chris W. Cox, chairman of the NRA's Political Victory Fund. "Actions speak louder than words. Downgrading Jon Tester to a ‘D' sends a clear message to Montanans that Jon Tester can’t be trusted to protect our constitutional rights." Tester also voted against confirming Justice Neil Gorsuch, but supported former President Barack Obama's nominees, Justices Sonia Sotomayor and Elena Kagan. Tester's opponent, Montana Auditor Matt Rosendale, has obtained a hunting license every year since 2002. The Cook Political Report currently rates the Montana Senate race as a toss up. This entry was posted in Politics and tagged 2018 Election, Jon Tester, Montana. Bookmark the permalink.